Are you one of the millions of women who feels like there is a giant boulder strapped to your back? You are exhausted but can't sleep. You find absolutely no joy in anything you do or in the people around you. You are forgetful and easily confused. You are overwhelmed, anxious, and emotionally bankrupt. In general, you feel like crap. Your doctor has told you it's all in your head and you feel like you are going insane! Mia Lundin has heard all of this before and knows exactly how to help. She has treated and cured more than 3,000 women of all ages and stages of life who felt like they were 'losing it,' and who were initially misdiagnosed and prescribed pointless antidepressants or one-size-fits-all HRT by busy doctors. After considering the whole woman and the lifestyle she lives, Mia revealed the culprit in almost all of her cases to be a combination of brain chemistry and hormone imbalance. Never a standardized solution, Female Brain Gone Insane is the first book to tackle the emotional symptoms and issues associated with hormone and brain-chemistry imbalances while giving you the same wisdom, advice, and results that Mia offers her patients through her private practice. Are you on an emotional roller coaster? Do you feel like you are losing it or going insane? One minute you are agitated and lash out irrationally at friends and loved ones. The next minute you weep and want to be held. You feel overwhelmed, sad beyond words, or scared for no apparent reason. You find it difficult to shut down your anxious brain to go to sleep and then you wake in the middle of the night wide-eyed, with your heart racing. You push forward with all of your might, but inside you feel like you are falling apart. You are not alone. Many women feel just like you, hoping and praying for an end to their suffering. All women share the same desires. We want to make life run smoothly for those we love. We spend our days fulfilling endless commitments and are dedicated to take care of everyone else's needs. But we can only do so much. Exhausted because we try to achieve impossibly high standards, we rush around to keep full schedules and make sure everyone is cared for. What happens? We rarely rest or pay attention to what is going on inside of us. In our mid-thirties to late-fifties, our bodies go through many changes. Our hormones, particularly the female hormone estrogen, can fluctuate radically, and our brain chemistry can become imbalanced. Having too much or too little of the hormones and neurotransmitters required for health and balance can create all kinds of symptoms that make us feel out of sorts, or worse. Common symptoms include crying spells, irritability, rage, panic attacks, uncontrolled irrational tantrums, anxiety, depression, faulty memory, insomnia, confusion, and fuzzy brains. Over time, we forget the happy, functional person we once were, and we only see ourselves as miserable with this litany of discomforts. Riding an emotional roller coaster is consuming and debilitating, plus it can be just plain terrifying. Jen was shaky and looked worn out as she sat down across from me, cradling the Kleenex box in her arms. She burst into tears and said, 'I feel like a complete failure.' Jen's best friend, Gloria, who accompanied her, confessed she was alarmed at Jen's erratic behavior including her deep fear of being alone. Gloria wrapped her arm around her friend's trembling shoulders. Then, Jen told me she worried that this nightmare might never end. I asked more questions. Jen informed me that in the last six months her periods were much heavier and more frequent than her usual twenty-eight day cycle. Based on Jen's symptoms, I knew she was in the hormonal phase called perimenopause. Her symptoms also pointed to a deficiency of the feel-good brain neurotransmitter known as serotonin. I ordered a urine test to measure Jen's brain chemistry levels, and it revealed she lacked enough serotonin. I started Jen on bioidentical progesterone, my basic vitamin supplement program, a protein shake with breakfast, and a precursor to serotonin called 5-HTP to raise her serotonin level. Jen called me two weeks later, well before our scheduled one-month follow-up. She sounded like a new person. She slept through the night and was no longer wracked with anxiety or agitation. Within two months of following my plan, her periods had normalized back to twenty-eight day cycles, and she felt like her old self again. Jen suffered from what I call Female Brain Gone Insane. Yes, it's a bit of a dramatic title, but over the last two decades, I've treated many women who feel exactly this way. Female Brain Gone Insane involves a disruption in the intimate dance between female hormones and brain chemistry, which results in deeply discordant emotional symptoms and endless distress. Women tell me they are falling apart and I believe them. Why? As with Jen, their symptoms are real, and they are caused by a true neurological brain-endocrine hormone imbalance. With just the right treatment, Jen was able to get through it. You will too! Female Brain Gone Insane, inspired by my female patients, brings together the most current research, protocols, tips, and powerfully effective solutions I've collected and crafted from many years of listening to and helping women regain emotional control, balance, and well-being. It takes everything I've learned and distills all of it into a practical emergency guidebook that leads you through an easy-to-follow customized Emotional Rescue Plan guaranteed to alleviate your current emotional distress. It would be great if you didn't have to work, if you didn't have a mortgage to pay or kids and aging parents to take care of; but you do, and you can't make those external stressors go away. However, simple hormone and brain chemistry adjustments can help 'thicken your skin,' and 'lengthen your fuse,' to change the way you perceive and react to physical and emotional stress. You are not defective, but rather a wonderful and sensitive woman who will feel good and thrive again. 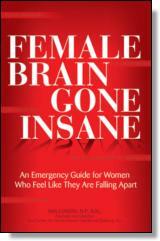 Female Brain Gone Insane will get you back on the road to sanity in no time. Mia Lundin, R.N.C., N.P., is an authority and pioneer in the field of women's health, with a specialty in treating the underlying causes of emotional symptoms experienced throughout a woman's life (PMS, postpartum depression, perimenopause, and menopause) due to brain chemistry and hormonal imbalances. Lundin is the founder and director of The Center for Hormonal and Nutritional Balance Inc., a thriving private health care practice based in Santa Barbara, CA, which attracts women from around the world. Lundin has successfully inspired and "balanced" thousands of women using her own treatment protocol, which combines bio-identical hormones, nutritional supplements including targeted amino acid therapy, mood food, and lifestyle changes. Visit the author at www.femalebraingoneinsane.com.